Week Beginning May 27th 2013 – My fourth week on site at Forfar Botanists Garden sees me begin work on the features that will be built into the south wall. With 5 name plaques to carve and two sculptures to form I have my work ‘cut’ out for me this week. After a trip to Tradstocks last week to select the stones the first day saw me do the rough work on the basic blocks. With an aim that the finished pieces contrast with a mix of colour & texture I chose a lump of pink Scottish whin & a piece of portugese grey granite, after the rough cutting, above it is difficult to tell which is which. Further details...read. 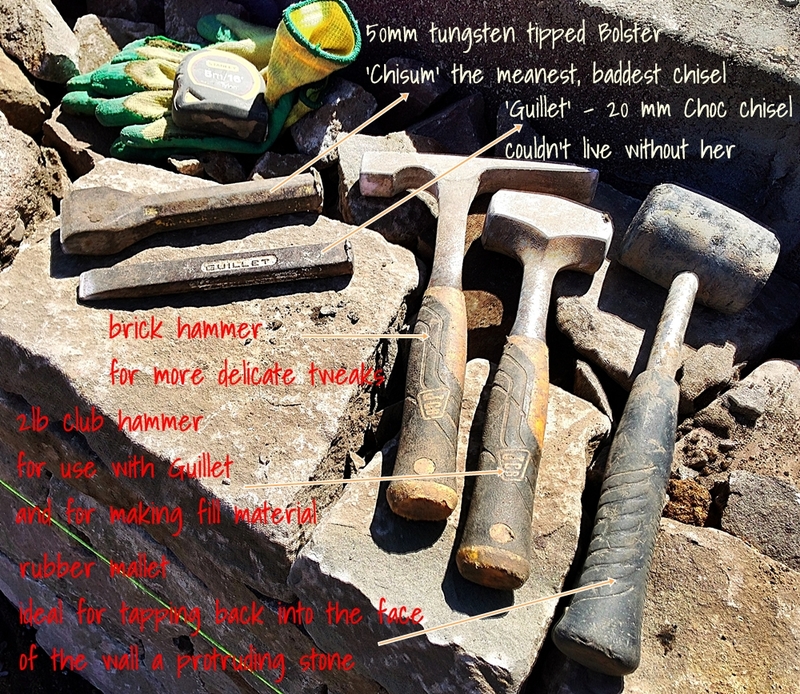 My simple but very effective toolkit for walling work. Progress is being made towards realising my proposals for the new Community Park in Tranent. Under the project title of A Place Of No Importance? I have been preparing ideas that will have public participation as a major part of the final scheme. Sharing personal stories & making a ‘Miners Tally’ is the way I intend engaging the public through the project. This is quite a complex commission with many different parts of the jigsaw requiring to be put in place prior to its going live. One of the first steps has seen me making a couple of prototype Tallies that will be sent off to Archibald Youngs Foundry in Kirkintilloch to be cast in bronze. Made with air drying clay I have formed two sizes to assess which will be most suitable. 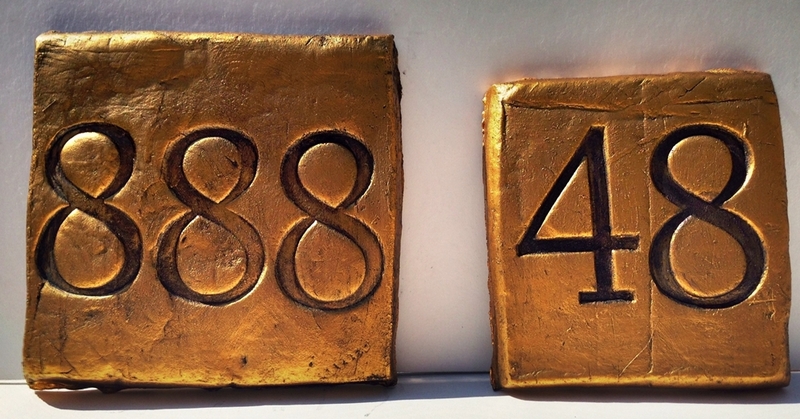 I got two sample aluminium numbers made which I have used to stamp into the clay, I love the the imperfections of the prototypes the way the surface has a life of it’s own and the way the numbers have picked up the buffed-in colour. Each one will be different and show signs of their being handmade, unique to the individual who made them. I have painted the prototypes to show to the clients how the finished tallies will look. Recovering from a broken leg is not the ideal physical condition to be in at anytime, continuing with it whilst constructing a series of drystone walls some may say is just downright foolhardy! Nevertheless this is the position I find myself in as work continues on the Forfar Botanists Garden. I am now two weeks into the project, two weeks that have proved to be tougher on my body than normal. Limping about on site has been exhausting, having rested up for the last 6 weeks it is almost as if my feet have forgotten how heavy I am! However I have found as long as I don’t push too hard and keep topping myself up with my happy pills I still appear to be making steady progress. Working closely with the clients some exciting additions to the scheme have been agreed and further details of this project as it develops can be found on the Forfar Botanists Garden Blog page. Though past the age where my complexion will benefit from the May Day morning dew, nevertheless the beginning of the month brought me my first early start for a long while! My leg is now well on the mend and site work is back on the agenda. Ground was broken today on ‘The Forfar Botanists Garden.’ Situated on a rectangular plot where changing rooms for the nearby sports field used to stand, the site will be the focus for my efforts over the next few weeks. First days on site are always the worst; is everything organised, what unforeseen problems will crop up, will deliveries turn up on time, logistically they can be a nightmare. Fortuitously today couldn’t really have went much better, the sun shone, the site was cleared and the foundation trenches were dug without a hitch. Concrete gets poured tomorrow and I’m eager to start working with the 50 tonnes of stone sitting there waiting to be built into the walls for the garden. Pictured above is some of the committee lending a hand for the local press.